In case you haven’t already noticed, I’ve been using horror movie genres as a run-up to Halloween. The effort would not be complete without paying homage to the 1932 horror classic The Mummy, from Universal Studios, directed by Karl Freund and starring Boris Karloff as a revived ancient Egyptian priest. It was the first horror movie I ever saw, on my grandmother’s round television screen. To this day, it remains one of my favorite films and the quintessential image of the romance of this area of personal fascination. No remake of this horror classic has, in my opinion, ever held a candle to the original, no matter what special effects have ever been used to tell the story. 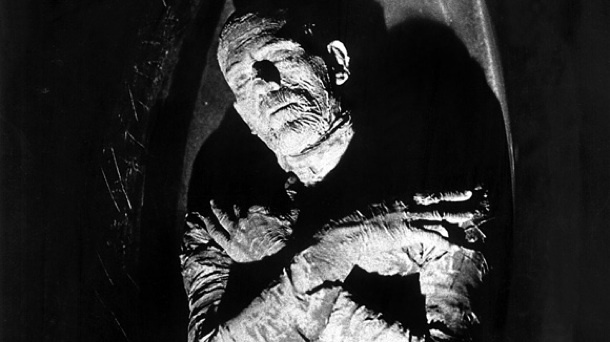 This is the story-line, according to Wikipedia: “An ancient Egyptian priest called Imhotep (Boris Karloff) is revived when an archaeological expedition in 1921, led by Sir Joseph Whemple (Arthur Byron), finds Imhotep’s mummy. Imhotep had been mummified alive for attempting to resurrect his forbidden lover, the princess Ankh-es-en-amon. Despite the warning of his friend Dr. Muller (Edward Van Sloan), Sir Joseph’s assistant Ralph Norton (Bramwell Fletcher) reads aloud an ancient life-giving scroll–the Scroll of Thoth. Imhotep escapes from the archaeologists, taking the Scroll of Thoth, and prowls Cairo seeking the modern reincarnation of Ankh-es-en-amon. “10 years later, Imhotep is masquerading as a modern Egyptian named Ardath Bey. He calls upon Sir Joseph’s son Frank (David Manners) and Prof. Pearson (Leonard Mudie). He shows them where to dig to find Ankh-es-en-amon’s tomb. The archaeologists find the tomb, give the mummy and the treasures to the Cairo Museum, and thank Ardath Bey for the information. In truth, if judged by objective standards, this film was probably not the prettiest girl at the dance. But she was my first love, and I will cherish her forever.